Six weeks of baseball clinics and scrimmages for all players of all ages. ** Update 2018-09-11 -- we have closed registration after overwhelming interest. The registration will allow waitlist registration, but a spot is not guaranteed. Please contact enrollment@skilestest.com with questions. 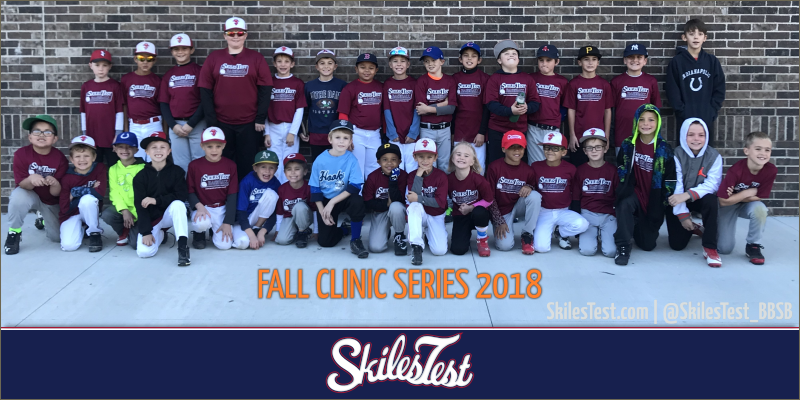 Registration is open for our inaugural Fall Instructional Baseball Clinic Series, six (6) weeks of clinics and guided scrimmages at Skiles Test this September and October. Boys and Girls are welcome but all skills will be based on baseball, not softball. We will look to include softball activities in 2019 when our fields are ready. Attend all six 3 hour sessions for only $60 per player, parent can participate for free. No experience is required to attend but players with past experience will focus on improving their skills and knowledge -- this is not an introductory only session. An official shirt will be provided to all players. All sessions will be hosted on Sunday each week from 4:30pm to 7:30pm. In the case of rain the activities will be pushed to the following week and the series will be extended a week. Our late Sunday schedule allows you to compete in other leagues and sports and still attend our clinics. Skilled positions such as pitching and catching will be taught. Pitching is only for players 8 and older. Players should dress for a typicall baseball practice. Baseball pants, cleats, and a glove are required. Bats can be shared, only bats with a 2 1/4" barrel are allowed. Each session will loosly be divided in half; the first half will be instructional followed by a second half to scrimmage and reinforce the skills that were taught. Each session will focus on different skills, so you don't want to miss a day if possible. Of course things do come up, so do not be discouraged if you expect to miss a date. Scrimmages will be modified to keep the game moving.